Andy Pye finds out about the possibilities for volume 3D additive manufacturing without post processing using augmented polymer deposition. Wohlers Associates reports that the commercial 3D printing market grew five-fold from 2009 to 2015 and forecasts more than four times growth from $6 billion in 2016 to $26 billion by 2021. Plastics represent 80% of that market. But current technologies have limitations which are holding back progress. Augmented Polymer Deposition (APD) was invented by Eugene Giller, Founder of Rize, who had previously developed inkjet technology-based approaches for rapid manufacturing and rapid prototyping at Z Corporation (later acquired by 3D Systems). Giller recruited Tom Davidson, Rize VP of Engineering who had also previously worked at Z Corporation. Despite the continued evolution of 3D printing, Giller saw that the technology’s promise was far greater than its real-world use for those who depend on prototyping or see the potential for on-the-go production parts. Users have to make sacrifices throughout the process, from file to usable part. For many, 3D printing hasn’t been viable because it wasn’t robust enough for the application, it wasn’t safe enough to use on the desktop in an office, or because the time and hassles of pre- and post-processing severely limited its use and effectiveness. Today’s parts made by 3D printers all require post-processing. Gary Rabinovitz, Reebok’s Additive Manufacturing Lab Manager says he spends about 50% of his time post-processing parts, including support removal, sanding, painting, coating and curing, delaying when he can deliver usable parts to his internal clients. Augmented Polymer Deposition (APD) involves simultaneous extrusion of a proprietary compound of thermoplastic and jetting of functional inks through industrial print heads to change the material properties of the thermoplastic. This eliminates post-processing. Gone are the messy and toxic post-processing materials, the special hookups and space required for post-processing devices and, most importantly, the hours of expensive labour required to deal with all of it. After the thermoplastic support is extruded using APD, a print head jets a layer of Release One ink between the support and the first layer of the part. The release ink provides just enough bond to prevent the part from slipping during printing, but enables the user to simply release the part from its support after printing, in seconds with their bare hands in a typical office environment, without mess, chemicals, special facility and storage requirements or filing. Rize will also provide other functional materials, such as conductive, thermo-insulating and thermo-conducting inks. This might be a way to create smart sensors from a 3D-printed part with active materials in it, or a battery within a 3D printed structure. Another capability is the ability to 3D print high-definition text and images onto the part. In this case, Marking Ink is jetted by the print head when called for in the file to print directly onto parts. Any given part is only as strong as its weakest point. Z-directional strength is impacted by the strength of the internal bond between the layers of a part. Most 3D printing technologies are unable to create parts that are as strong in the Z-axis as they are in the X- and Y-axes due to weak bonds that form between each layer of material. Those bonds are referred to as anisotropic – their physical properties have different values when measured in different directions. 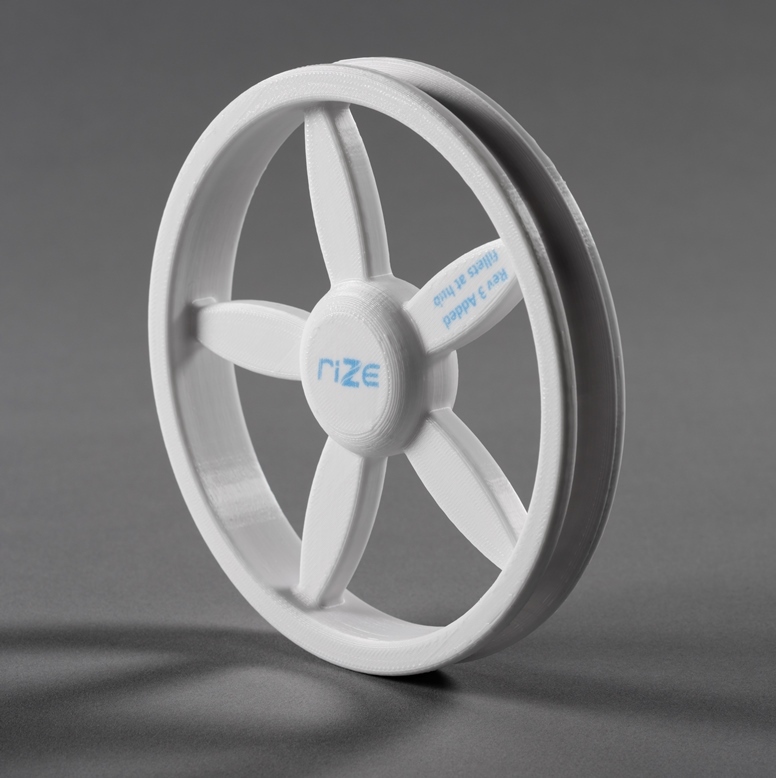 Rizium One is Rize’s proprietary compound of engineering- and medical-grade thermoplastic. It has properties similar to polycarbonate (PC), such as strength, but it has high strength in the Z-axis, due to the way that the material bonds during the process. Parts made this way only experience a 10% loss in isotropic properties, compared to stock material – not even all injection-moulded parts have 100% isotropy, due to the way that moulds are created. In comparison, typical traditional FDM parts lose around 40% of their Z-strength and, therefore, are not nearly as strong as Rize parts. The industrial-class Rize One has a build volume of 300 x 200 x 150mm that will accommodate 80% of industrial parts, it was designed to 3D print multiple parts simultaneously, on demand, 24 x 7 x 365. Watertight, isotropic thermoplastic parts built with Rize’s APD process have a resolution of 0.25mm and high-definition 300dpi text and images.